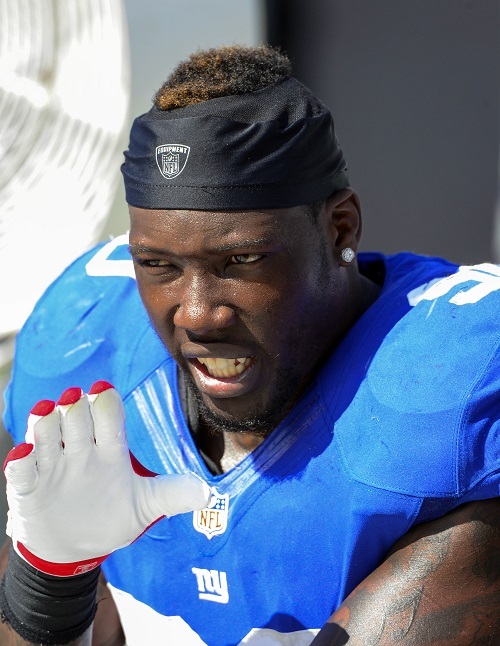 When Jason Pierre-Paul arrived for Giants’ training camp last year, there was a lot of him to love. The hefty JPP caught the ire of Tom Coughlin as the coach let media know at the 2013 NFL’s annual meetings that the standout defensive end reported to camp over weight, a circumstance that potentially contributed to an off year. “He was big when he came to camp,” Coughlin told The New York Post. So when Pierre-Paul spoke to media for the first time this season during the second day of the Giants’ offseason conditioning program, he made sure to let all those in attendance in on a little secret. Since recording 16.5 sacks his sophomore season, one of the league’s best defensive ends has been playing at a level far below the one displayed on New York’s Super Bowl Championship run. In the last two seasons, Pierre-Paul has managed just 8.5 sacks. Last year’s total of two in 11 games were the lowest of his career. Even as a rookie playing behind Justin Tuck, Mathias Kiwanuka and Osi Umenyiora, the former first-round pick was able to muster 4.5. Despite this, Pierre-Paul said he feels no added pressure to show doubters he’s the JPP of old. There’s also little question in the 25-year-old’s mind that he can return to the player that once garnered “Defensive Player of the Year” consideration. With Justin Tuck playing on the opposite coast, New York will need JPP more than ever. Throughout his career, Pierre-Paul has always had proven veterans to look up to in the meeting room. Umenyiora is gone, Linval Joseph too, leaving just Pierre-Paul and Kiwanuka to lead a group that is otherwise occupied by unproven commodities. The Giants spent the offseason rebuilding, retooling and upgrading a secondary that had long be an after thought to Jerry Reese. Throughout his tenure, the GM operated under the belief a strong past rush could mask a weakness in the last line of defense. While the strategy worked for two championships, teams have found a counter to the Giants’ ferocious pass rush. Quarterbacks have worked to get rid of the ball quick, well before the cornucopia of defensive ends reached the opponent’s passer. After bringing down the quarterback 46 times in 2010 and 48 in 2011, the Giants haven’t recorded more than 34 sacks in either of the last two seasons. Aside from signing run-stopper Robert Ayers, the Giants have yet to truly make a splash to upgrade its pass rush. Sure, there’s Damontre Moore, but for now last year’s third-round pick is more of potential than anything proven. If Pierre-Paul returns to form, it may be a bigger upgrade to the Giants’ defense than any free-agent signing or draft pick. To Pierre-Paul, that means staying healthy.